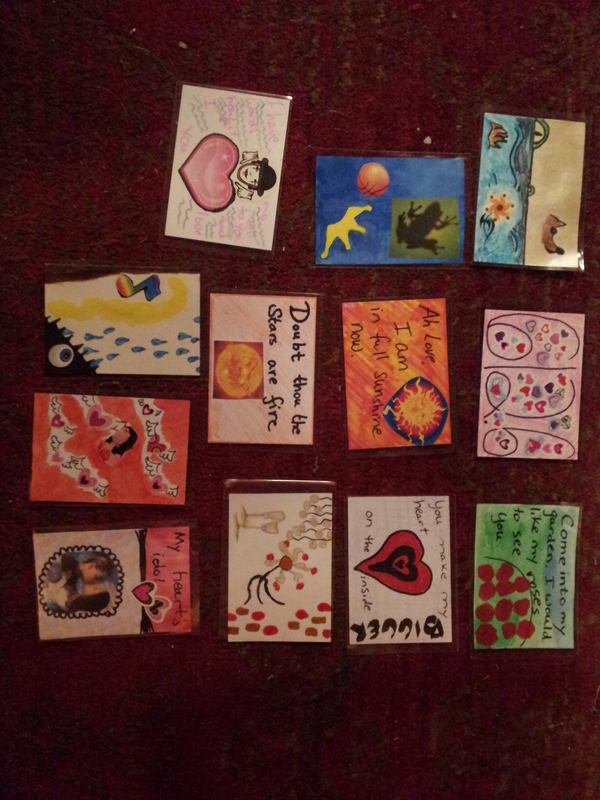 Over Christmas, my SiL pulled out an awesomely smelifurous crafty thing. Wadgie had been hanging on to tons of glass bottles with eyedroppers for just such an occasion. She also gathered all her essential oils and grape seed oil. 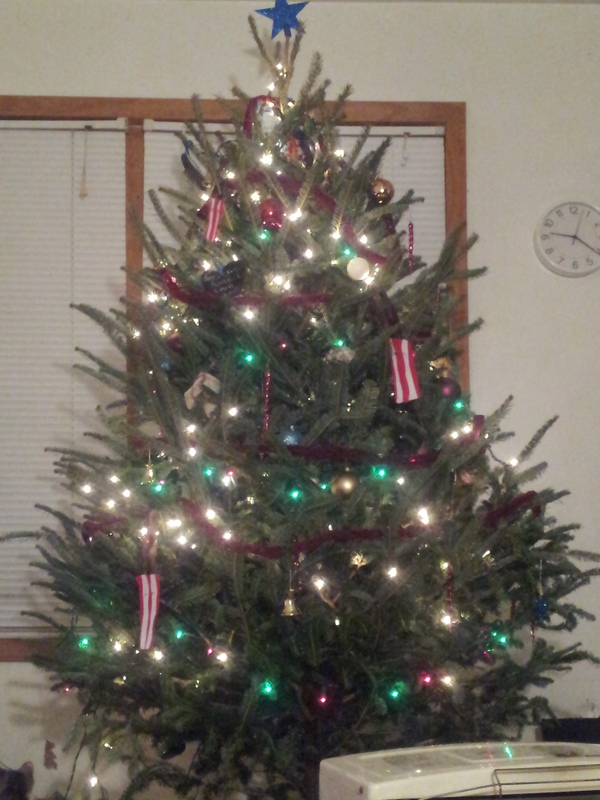 Then the smelling commenced. 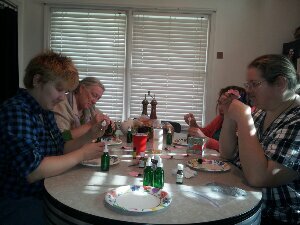 We got to smell the different oils and my other sister brought some tiny vials of fancy perfume that we got to whuffle. Whuffle–To smell vigorously. As a dog looking for a treat hidden in bed covers. I would share some recipe, but it really depends on your individual likes. Put a desired amount of grape seed oil in a bottle. 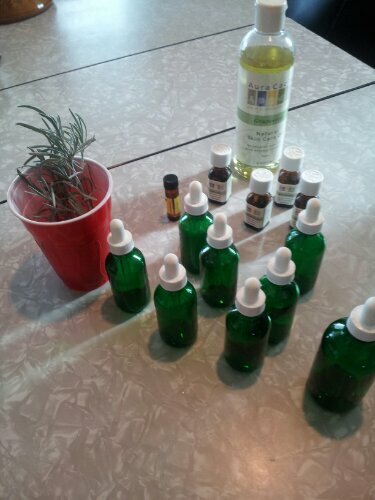 Add an essential oil you like drop by drop. It is easier to make the scent a little stronger by adding a few more drops. I mixed a bottle of lavender and infused it with leaves from a lavender bush in the front yard. My second bottle used one of the perfumes called Snapdragonfly. It has almost a vanilla and cotton candy sweetness to it. 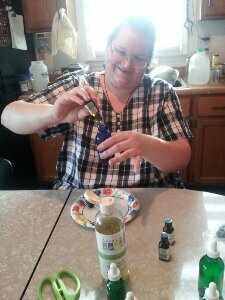 For my final bottle I used the grapefruit essential oil. That will be lovely to use once the fruit trees start blooming. 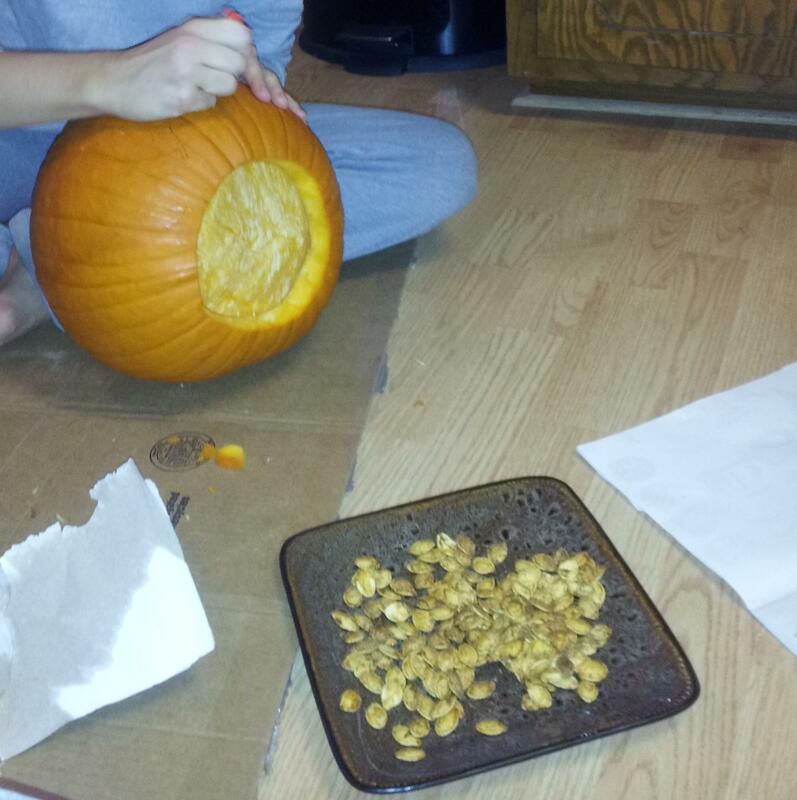 Because we had so many smells flying around we had to make sure each one was perfect. We ran out of “clean” spots on our hands and wrists. 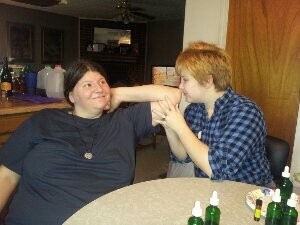 We had to start using elbows for smell tests. I mostly I put a few drops on both elbows and hands. My hands especially get super dry and cracked in the winter. Rubbing it in takes just a second and the grape seed oil soaks in faster than many greasy lotions. My SiL also uses it for a nice relaxing soak in the bath tub. Just put enough drops in to satisfy your nose and hop in! 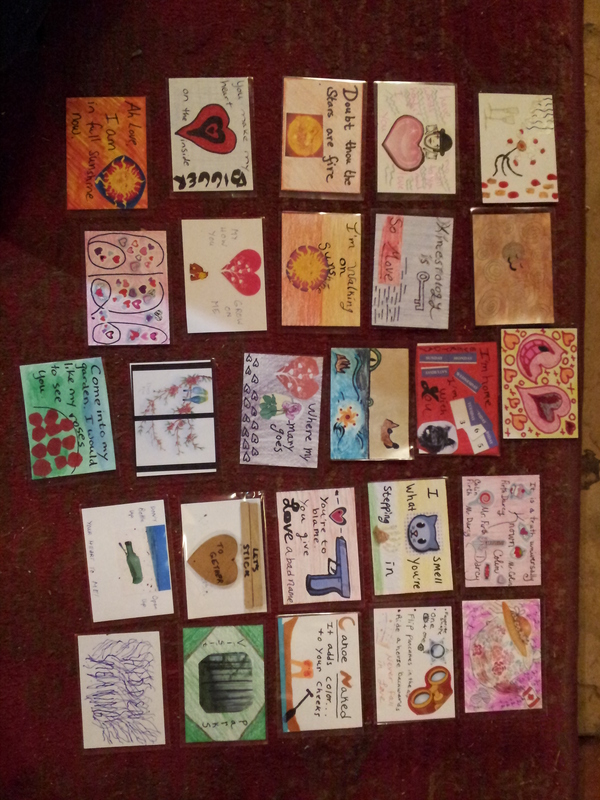 This was an awesome activity to get our noses working around Christmas. I tried to drag Kit into the mix, but as you can see it turned into a girls only smellathon. I can’t believe how much fun we had! 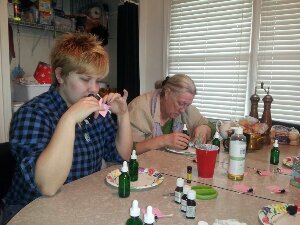 May have to buy some more essential oils and do this again or at our next get together! 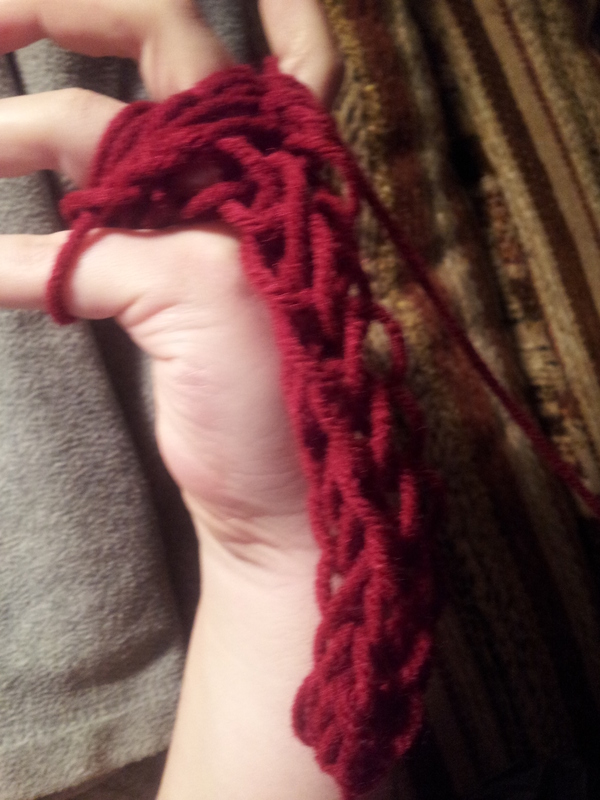 Just before Christmas I discovered this craft called finger knitting. Okay, I might be stretching the truth. 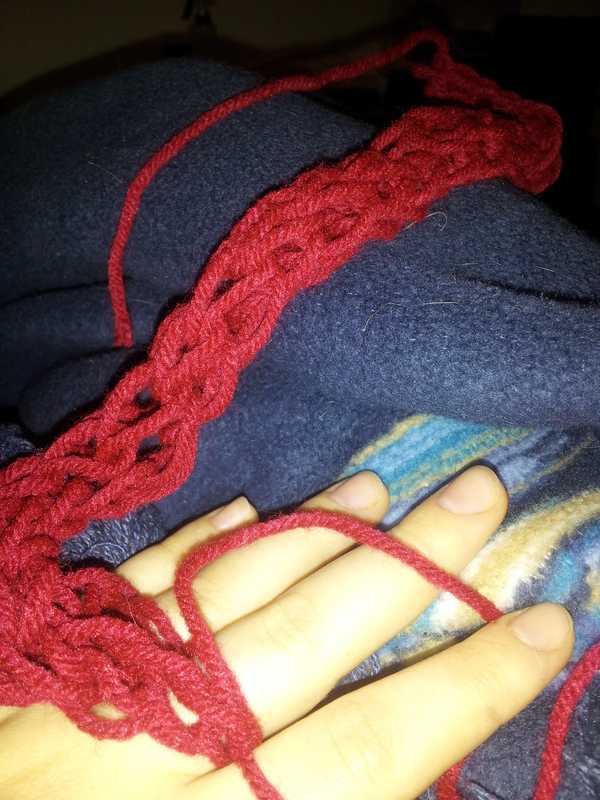 I had a pin for finger knitting, but had never tried it and found out the Instructables video (linked below) that Beffers found was much simpler. Beffers (my SiL) learned it and showed me how cool it was. 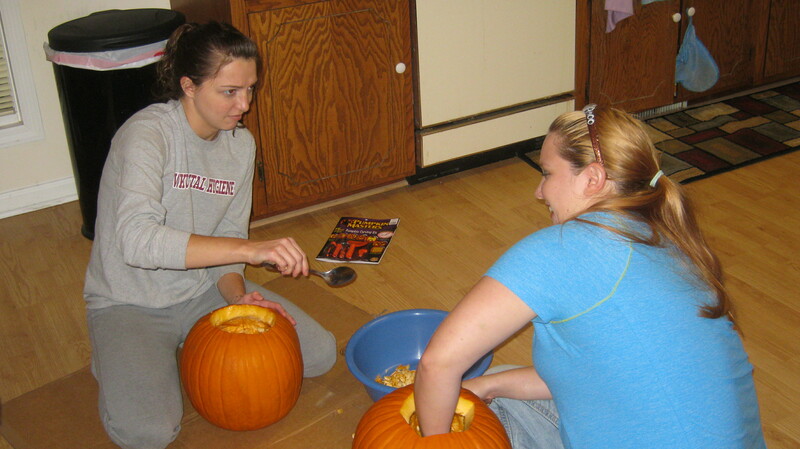 As soon as she showed me what she was doing I demanded she send me the pin and help me along. Yes, demanded is the right word. I lacked the gumption ever try it. And yet, it didn’t need gumption to learn! Just about 10 minutes and then I replayed the video to make sure it sank into my brain. 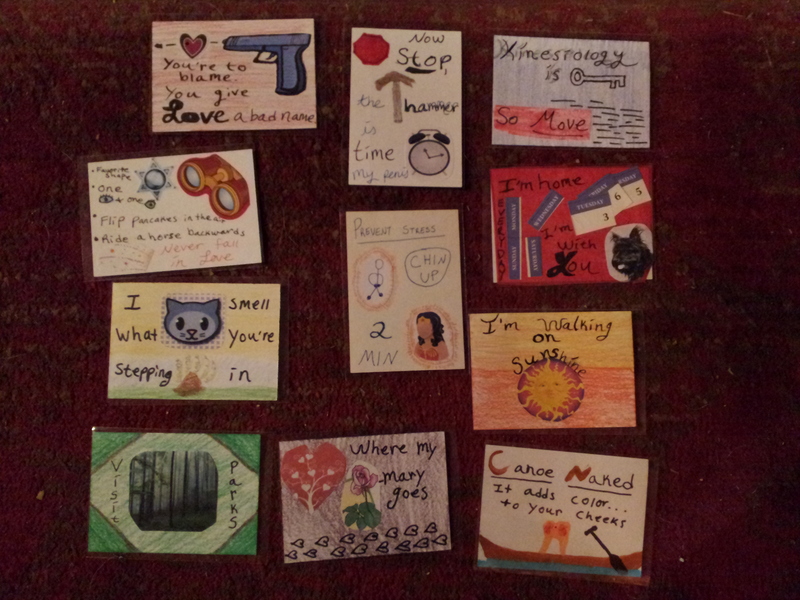 It makes me wonder what other gems are hiding in the depths of my pin boards. Are you a cool pin hoarder too? Here is the link to the sweet tutorial video. Before you click I want you to know that the video is a little odd as it is shot upside down and the maker of the vid at one point misidentifies her fingers. Just keep watching what her hands do and don’t worry about silly little things like a mix up in words. Instructables wins again! There are many different things you can do with your finger knit projects depending on your level of creativity. Bracelets, scarves, and (my favorite) Christmas tree garland. Beffers followed the tips on this website, the blogger made several different strands of different colors and then laced them together to make a beautiful rainbow scarf. It helps that Marlena has phenomenal hair to go with her lovely rainbow scarf. 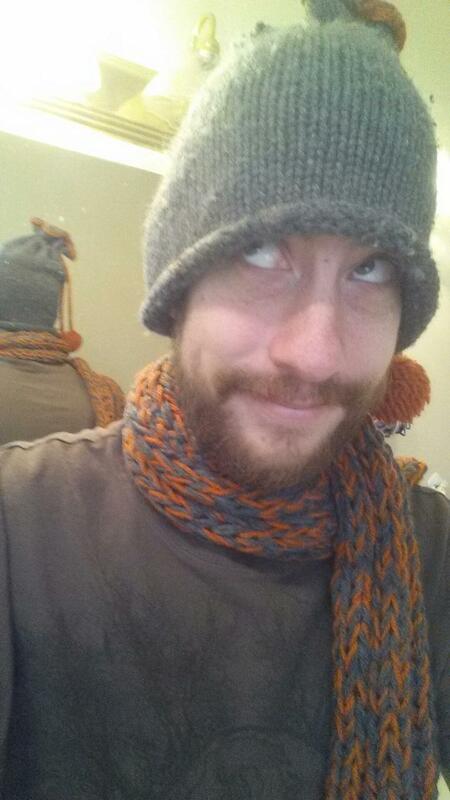 Instead of making a rainbow scarf, Beffers knitted orange and gray together then laced the strands to make a huge fluffy scarf to match the handmade hat her hubbster had received as a gift the previous year. You gotta love handmade matching fashion! A couple of quick tips to add to the awesome bloggers and instructors there already are out in the world. To take a break and save your work put your finger loops onto a chopstick. I was going for marathon knitting and couldn’t avoid a potty break any longer so that tip really helped me. If you are teaching a younger person or it is your first time trying finger knitting, avoid the fru-fru fancy yarns and just pick a no frills yarn to learn. Later on you can do the fancy stuff but it is important to learn it at first. Fall is my favorite time of year and I realized that it has become a thing to make seasonal bucket lists or other short term Fun To Do lists. I searched the topic to death and came up with a massive fall season Bucket List. 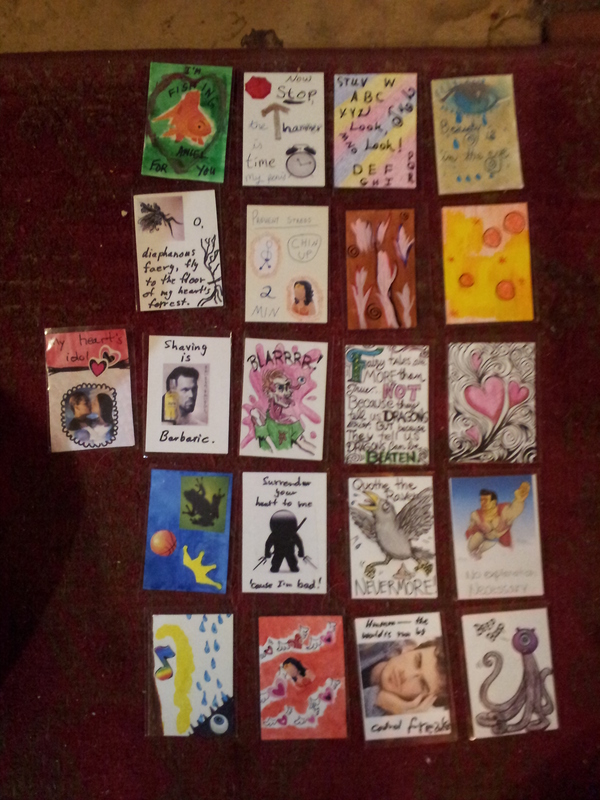 I have already completed a couple and will insert those pictures as breaks from straight text. 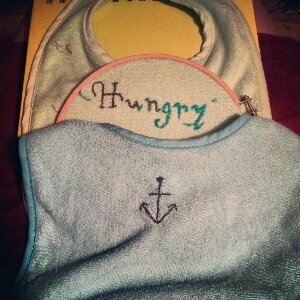 I found a great craft on Pinterest done by The Crafty Blog Stalker. 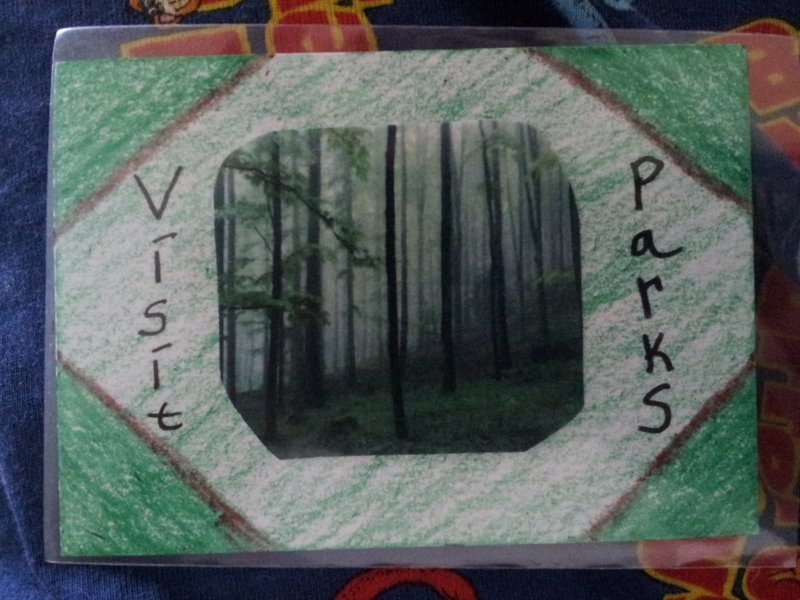 The best part about this craft is that it is almost entirely a Dollar Store Craft. The one exception is you must buy or already own a hot glue gun and glue sticks. Step One: Gather supplies and get a workspace. 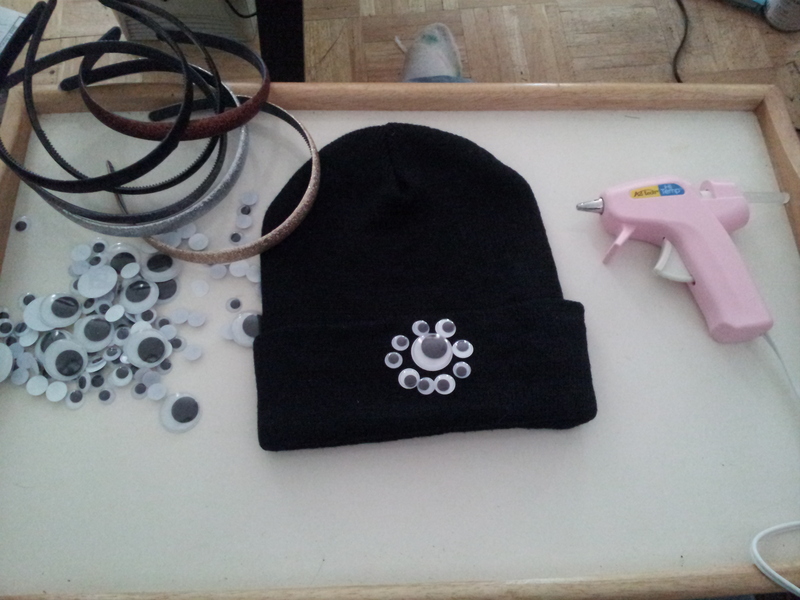 Step Two: Plug in your hot glue gun. For the hat–Lay out a pattern that you like. I put a piece of cardboard (used the tag from the packaging) between the hat fabric layers. It would be lame to make a fun hat that you inadvertently glued shut. For the headbands–Pick out a pattern that you like. 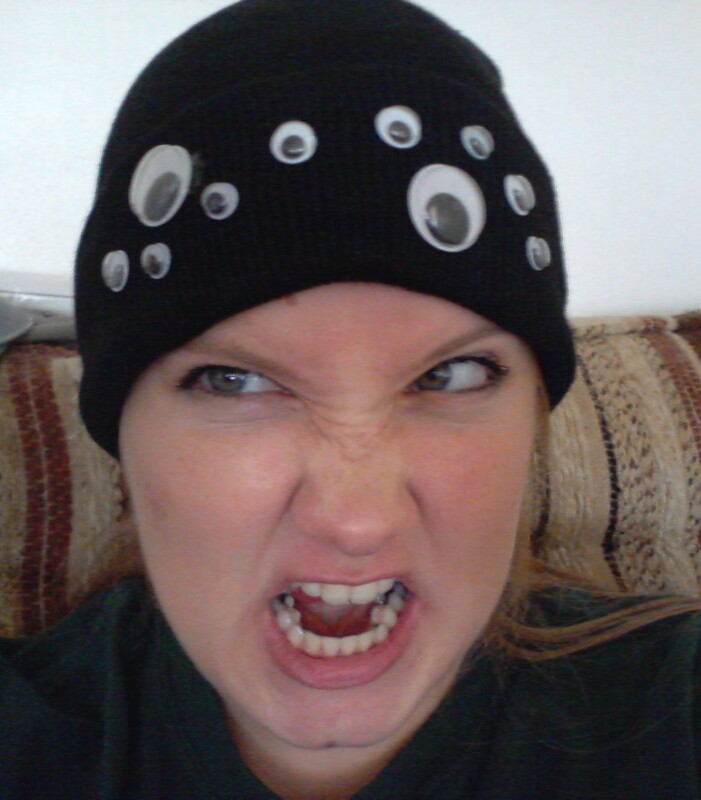 Step Four: For hat–Apply dots of glue to the backs of the googly eyes and stick to your hat. Allow to fully cool and dry before throwing it on your head. Again, you don’t want to have glue and hair and forehead all trapped and boiling hot. 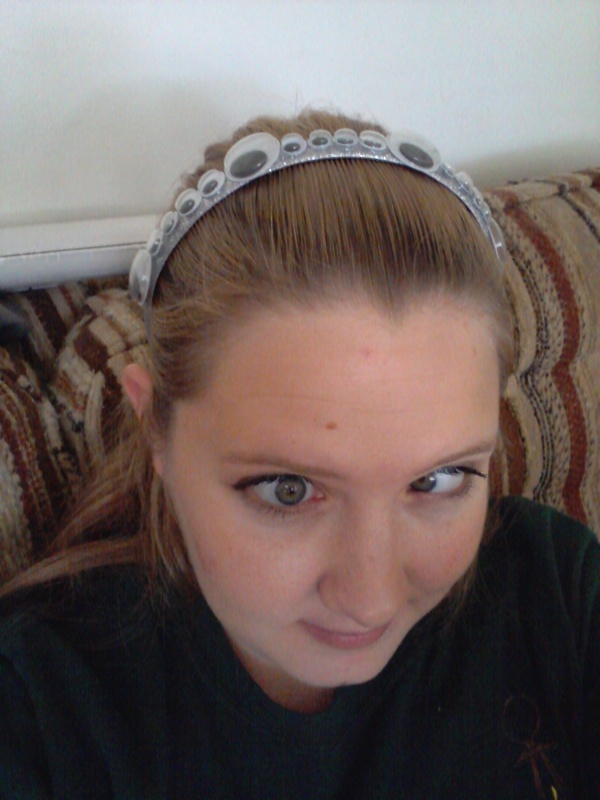 For headbands–I applied glue to the headbands directly because my headbands were a bit more narrow than my big googly eyes. Be very careful not to get glue on your fingers. It’s stinkin’ hot! For the large eyes, I mashed them down and waited a couple of seconds to make sure I didn’t knock them back off while they were still cooling. Step Five: Once you allow the pieces to fully cool, I picked away those little hairs that I always seem to have to deal with when hot gluing. After doing that bit of housekeeping, throw on your accessory and hit the town. 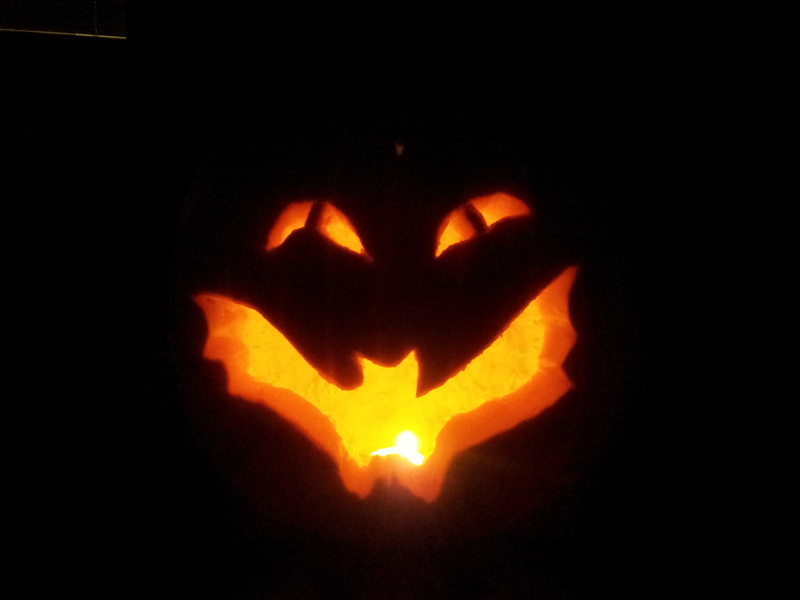 I believe that people should dress up, or at least start getting festive during the whole month of October. I think the headbands would be a great accessory for people to wear who work in places they are not allowed to dress up. Offices and such typically err on the serious side. 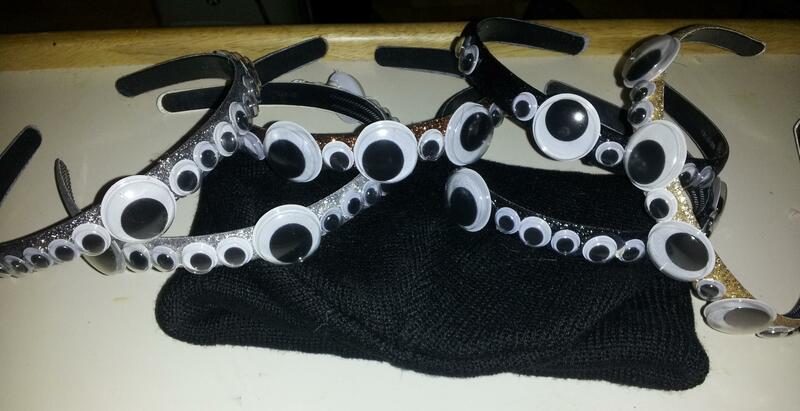 Hopefully your office doesn’t have a policy against wearing googly garb. Kids: Get someone intelligent to supervise you. Or better yet, learn how to properly use tools, because when you’re an adult no one will stop you from chainsawing your fingers off. Hot glue is painful, please be careful. This would make a fantastic costume piece too. For example: I am working on creating a cherubim costume. The cherubim from L’Engle’s Wind in the Door were described as being a mass of eyes and feathers and wings. I believe a huge package of craft feathers and more hot glue is in my future. Feel free to use this idea and out-nerd all your friends at the next Halloween party. 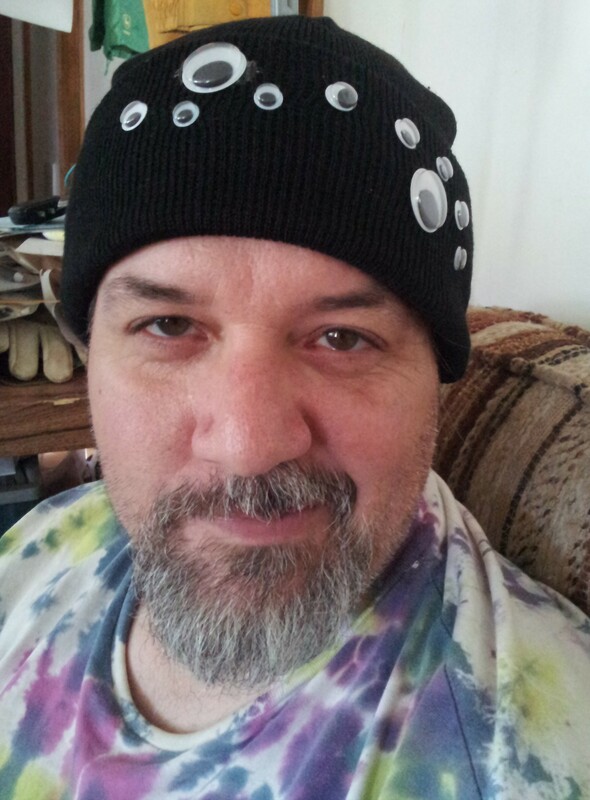 Perhaps more simply, this could be the spider eyes for a fun spider costume. A couple of weeks back I went on a mini-vacation, just to get away from it all. 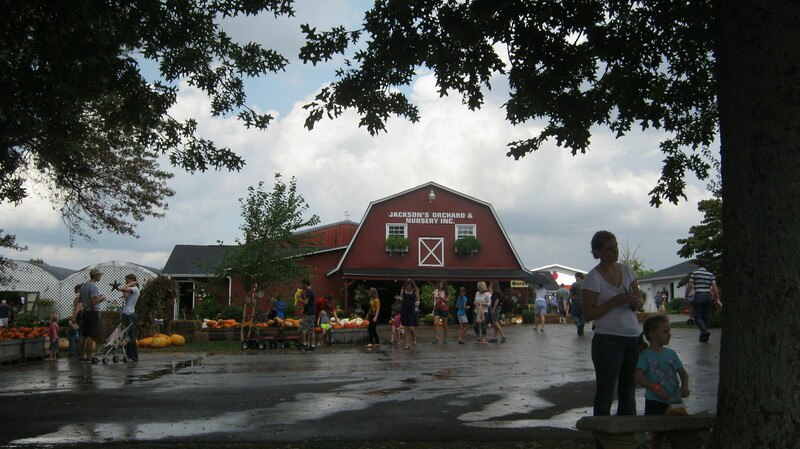 I decided that I was going to the beach….In Illinois. 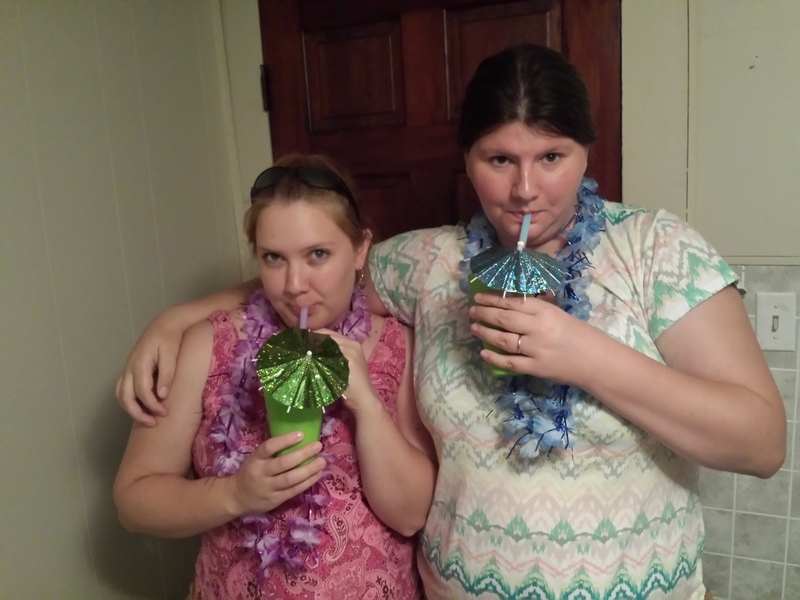 My SiL, Beth and brother planned an epic Luau party. 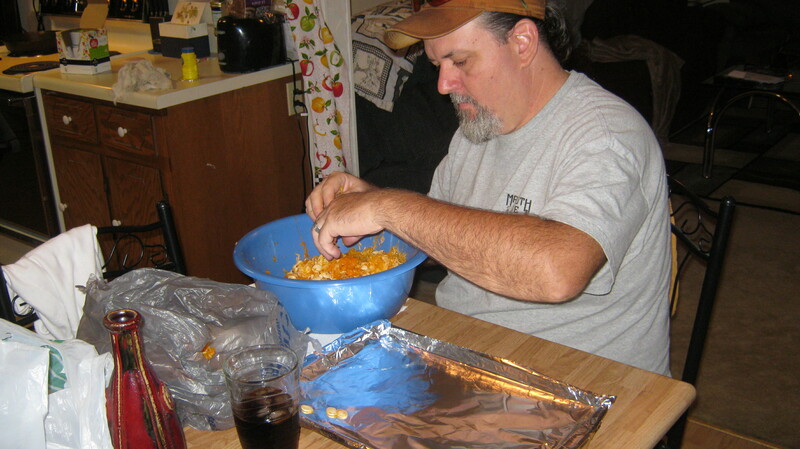 Here are pictures, links, descriptions and recipes to what we did for our Par-tay. 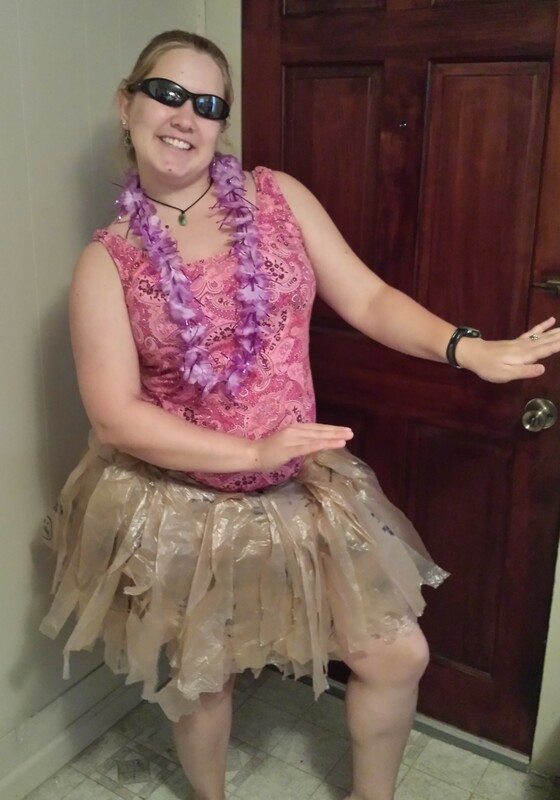 Believe it or not, it is very difficult to find Luau related party garb in September. However, true party planners never come up empty. After visiting several stores we got serious and ended up at a party supplies store. 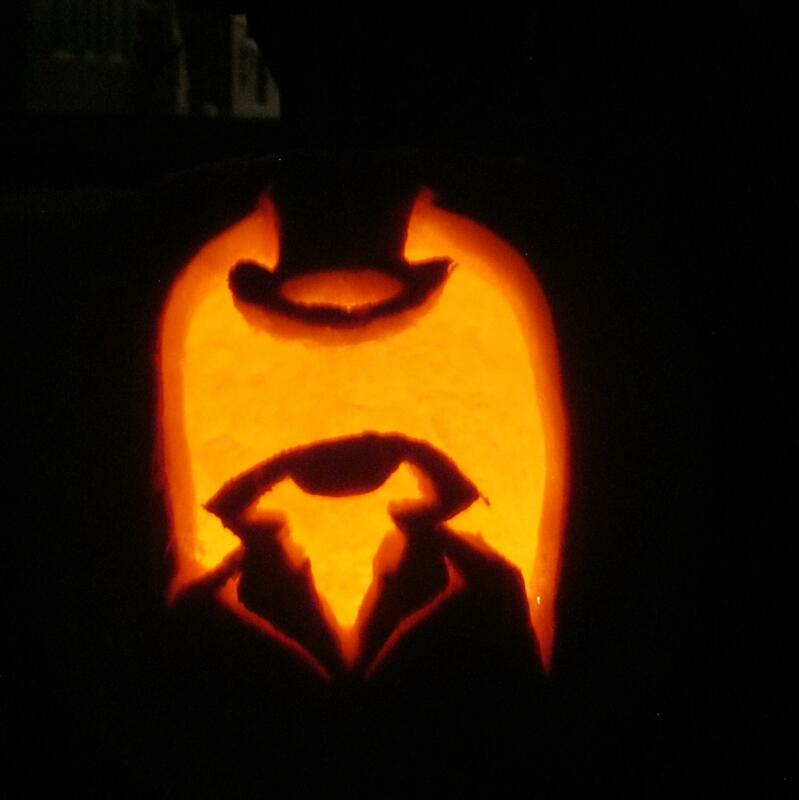 We hunted all over before finally getting desperate and asking gentleman sporting an officials vest—He was labeled as a Halloween Expert. He also turned out to be a store expert and pointed us directly to the quarter aisle of luau supplies. We didn’t need much. We left the store with three sparkly leis in our favorite colors. 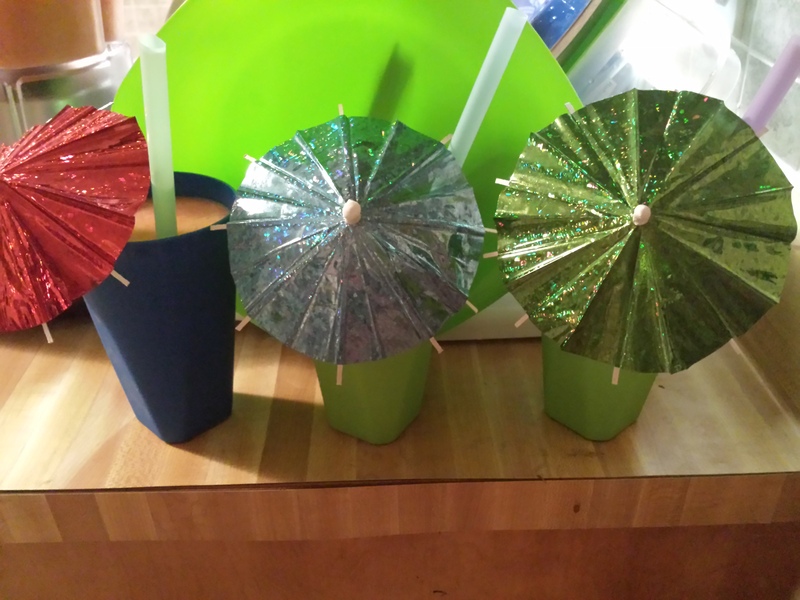 We also grabbed a pack of shiny umbrellas to embellish our drinks. I brought some large colorful smoothie straws from home. They were purchased at salvage for $1.25. Some things we didn’t find in the store is pictured above. 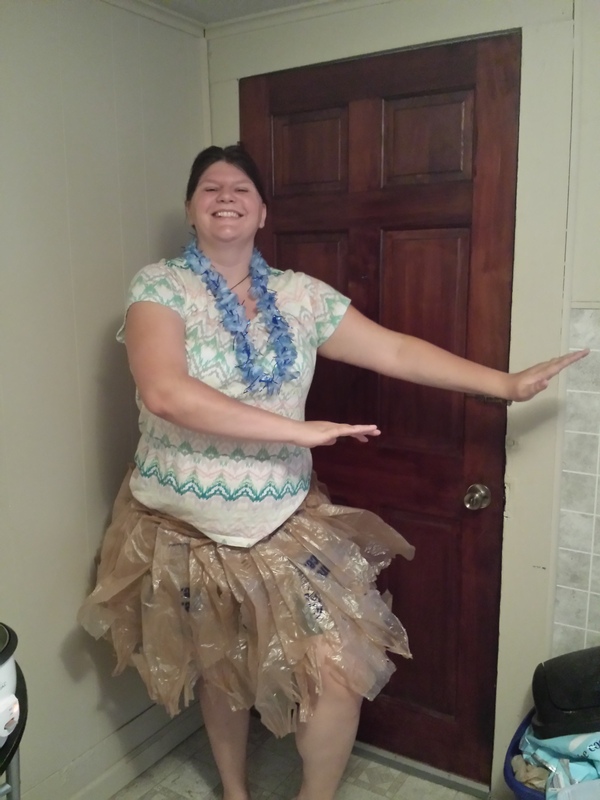 Because money can’t buy a Hawaiian style skirt such as this! If you’re looking at cost or supplies needed: Staples and stapler, grocery sacks, and a binder clip for quick clasp of skirt. We’ll get to how you make it later. Essentially, we purchased all of our accessories for under $10. I would call the drinks daiquiris, but truly, they were so much more than that. 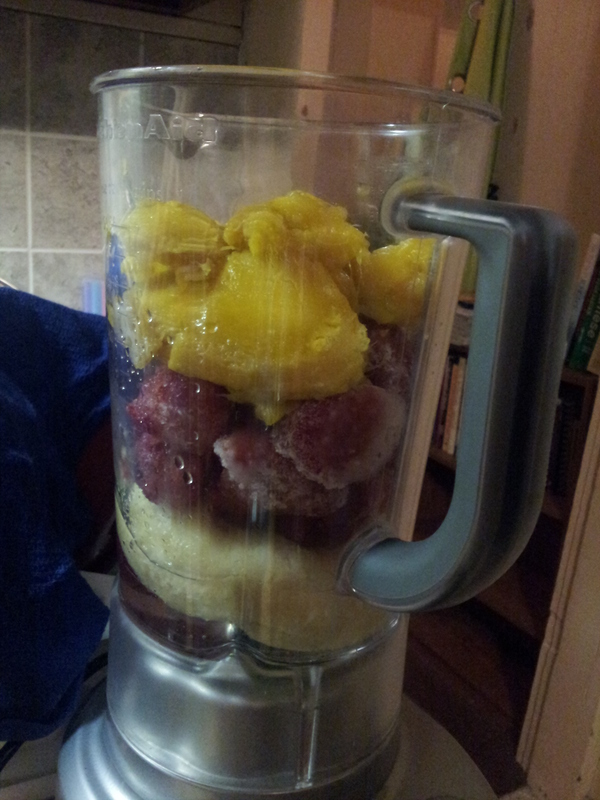 We added: very ripe bananas, frozen strawberries, mango, fresh pineapple, and tropical punch flavored white rum. Blend well and serve immediately with awesome umbrellas. Asparagus. Yes, I did just have this in my fridge and it needed to be cooked up. I love asparagus. If you cook it, I will eat it. 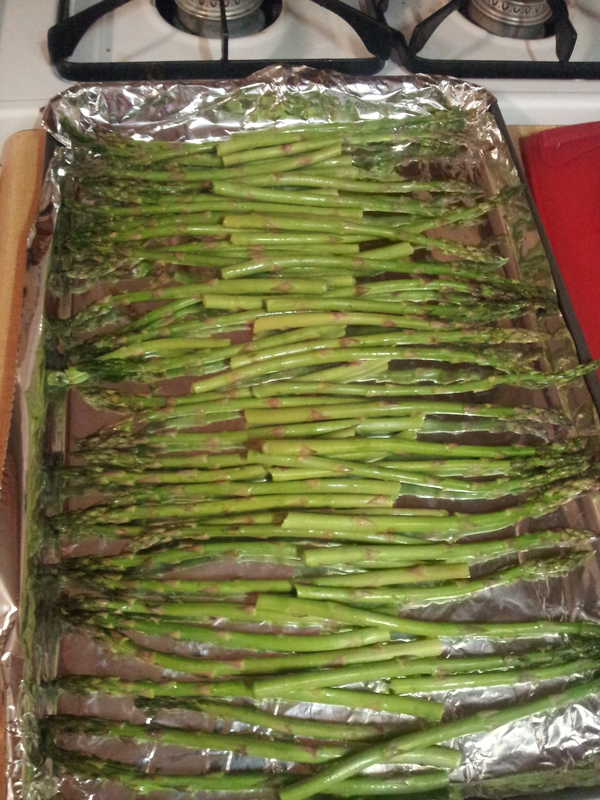 This were laid out on a cookie sheet with olive oil, salt and pepper. Roasted in the oven until delightfully crispy. 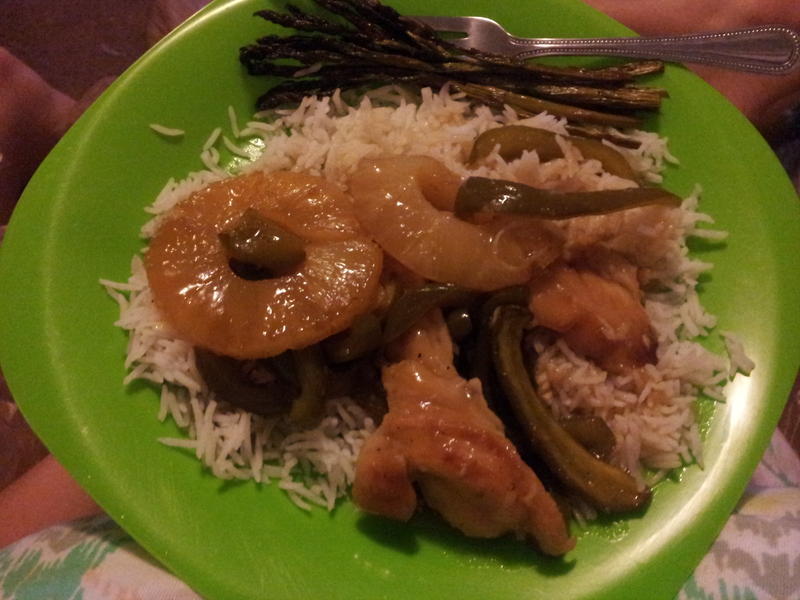 The very best and the highlight of supper was our Waikiki Beach Chicken and Tom’s Waikiki Beach Tofu (he’s vegetarian). Want to know the original recipe that Beth based the above on? 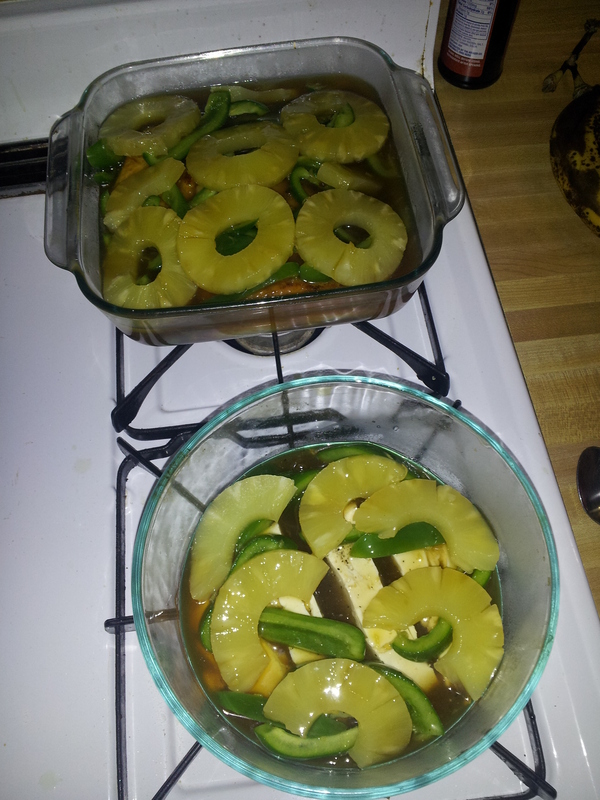 Here is the original Waikiki Beach Chicken recipe. We loved it! Here are some of our recommendations: We backed off the sugar in the sauce to 3/4 cup instead of a whole cup. You could back down to a half cup. We liked ours on the salty side, no worries, a dash of soy sauce and overnight the flavors mellowed so it was even better! We used boneless skinless chicken breasts and it did seem to take forever in the oven—This could have been because we were starving and are like small children waiting for Santa. I don’t have much advice about the tofu version. Tom said it was delish though. If you have questions, please hit me up and I will consult the veggie-guru that is my brother. Why is music so important? Don’t ask such stupid questions. 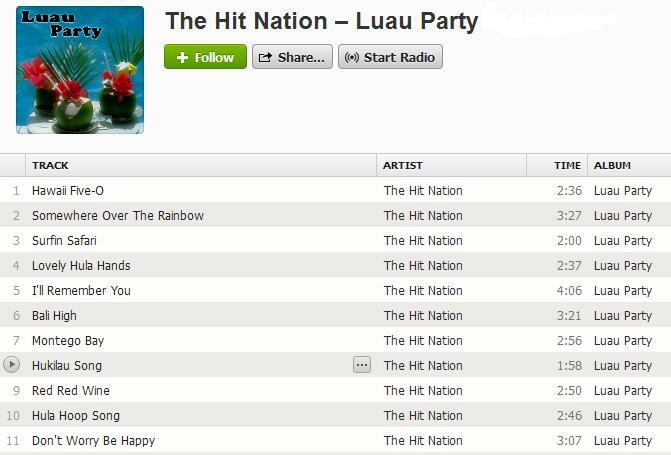 This will set the mood and help aid in the silliness that is a faux-Hawaiian. The more important question might be, Kat, what did you listen to? That is something I will answer. We used Spotify to keep our music rolling throughout the evening. No, they aren’t paying me money to use their name and yes, I wish someone was paying me for this drivel. 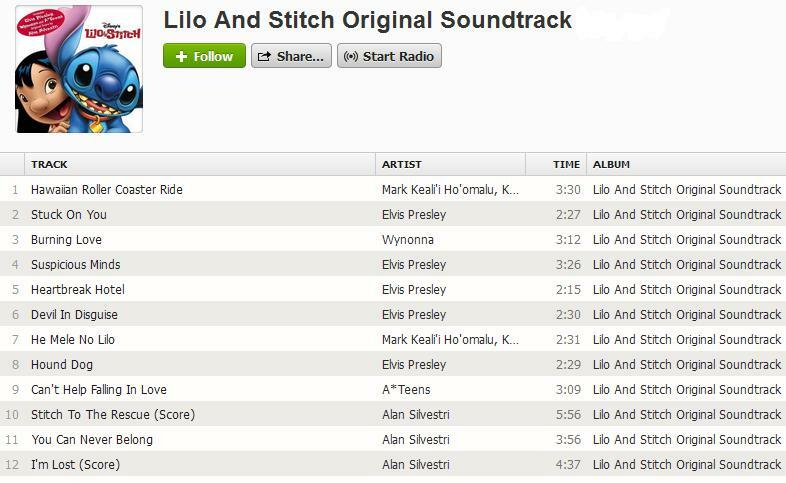 The obvious first choice here, the soundtrack from Lilo & Stitch the Disney flick. Now, I don’t care if you like the movie or not. The music is sweet. Beth and I wanted to get in the mood before the party got started. Hawaiian Roller Coaster Ride and a little Elvis. How can you go wrong? Tom was smartsies. He found this premade Hit Nation playlist on Spotify and it had nice nice tunes on it. Both playlists are, as you may have noticed, finite. We needed more music so we added some tracks from these selected artists: Beach Boys, I accidentally added and discovered Spike Jones and His City Slickers, and more songs from that dude that sings Somewhere Over the Rainbow (Israel “IZ” Kamakawiwo’ole, I didn’t know either). 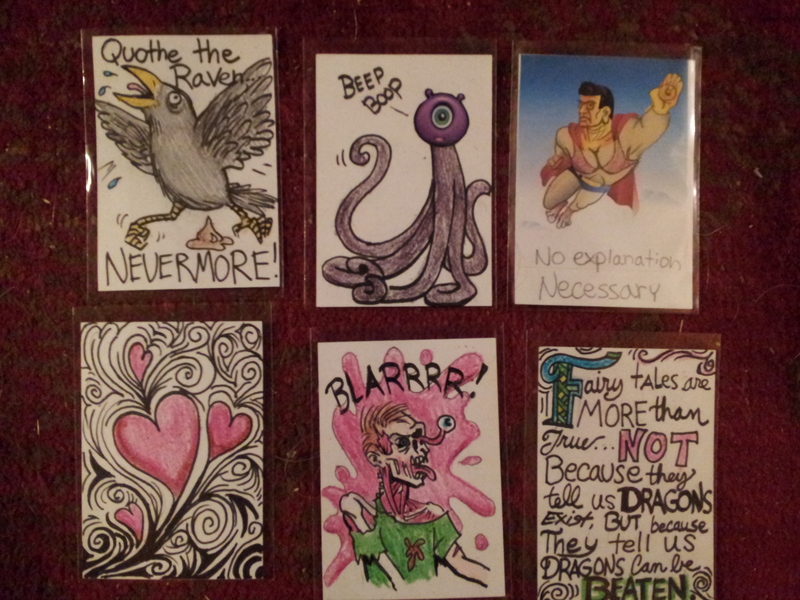 I am pretty sure I have discovered that next silly artist that my brother will get into. Spike Jones and His City Slickers have lots of weird and funny songs. Go ahead and listen to Water Lou (drip, drip, drip). I am sure that it is on….ah, there you are. Tom also added some more awesome ambiance to our party by muting and playing this youtube video that shows 43 minutes of Hawaii landscapes and such. It was beautiful. If you need something to play in the background of your life, I highly suggest this. 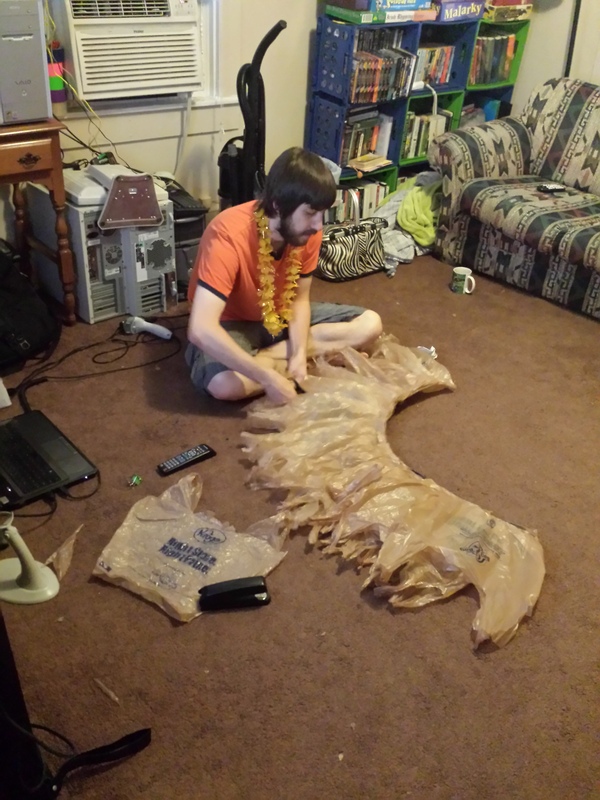 Let me know, via comments, if you are interested in a step by step instructional blog on how to make a Hawaiian style “grass” skirt. Just to recap, we used grocery sacks (Kroger has brown!) 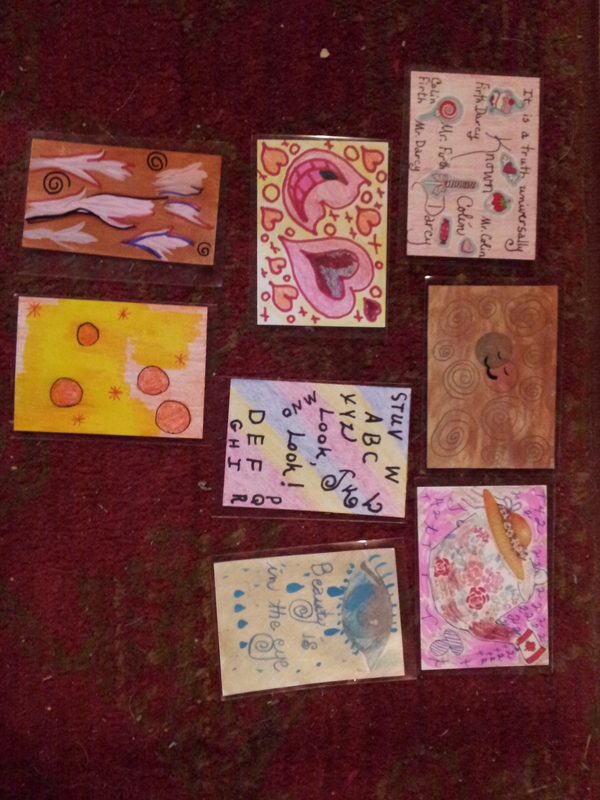 that were fanned out or staggered then stapled together. 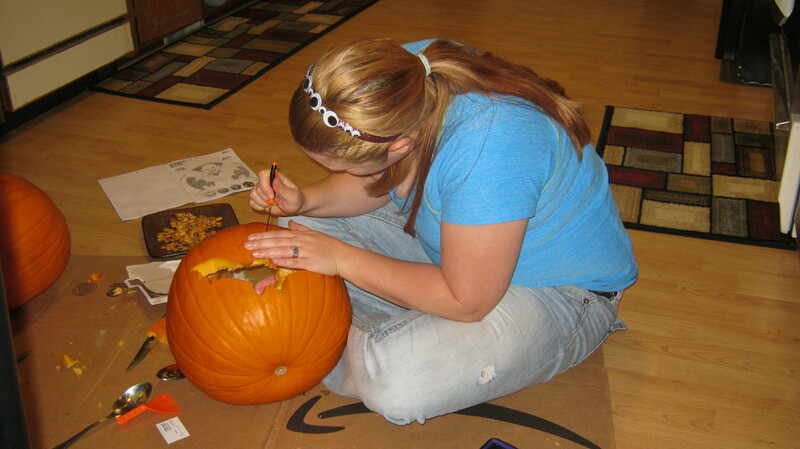 If you are making one for a child or small adult you may want to add a second layer around to add more fluff. Cut slits almost to the stapled area (leave about two inches). Use a binder clip to pin it around the waist quickly. Do not try to go to the bathroom in these guys—you will want the quick removal aspect. Tom is cutting the slits in his grass skirt. Now, go and enjoy your own luau party!! 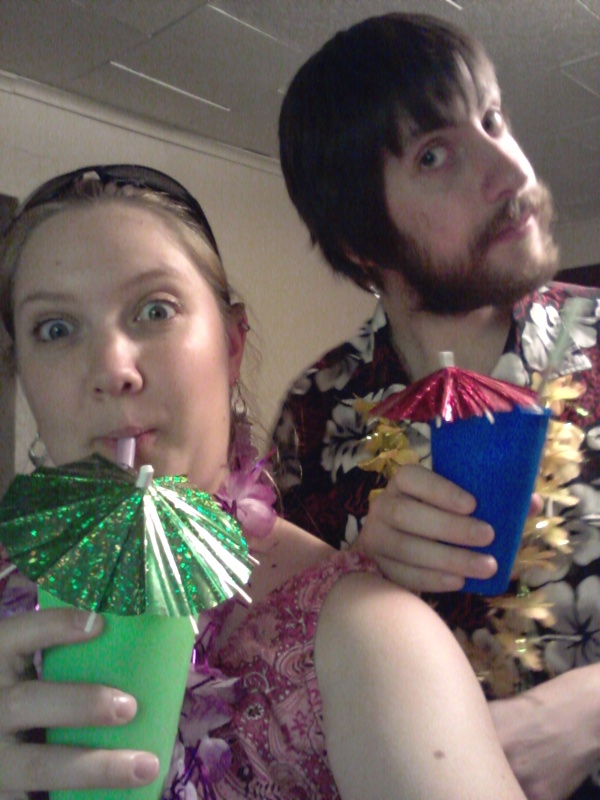 We did some hula dancing tutorials on youtube, but ultimately were too full and just laid around the rest of the night. It was great fun! !